Nicole Stafford is a contributing writer. 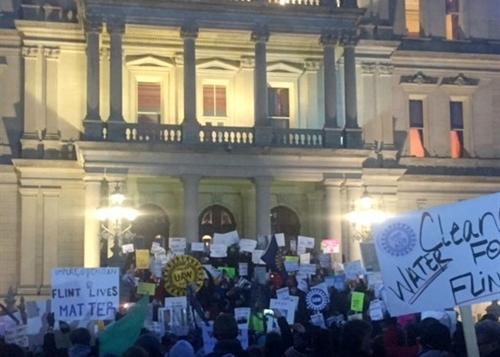 Under the heat of the national spotlight on the Flint water crisis, Republican Gov. Rick Snyder’s political future has received its burn notice. 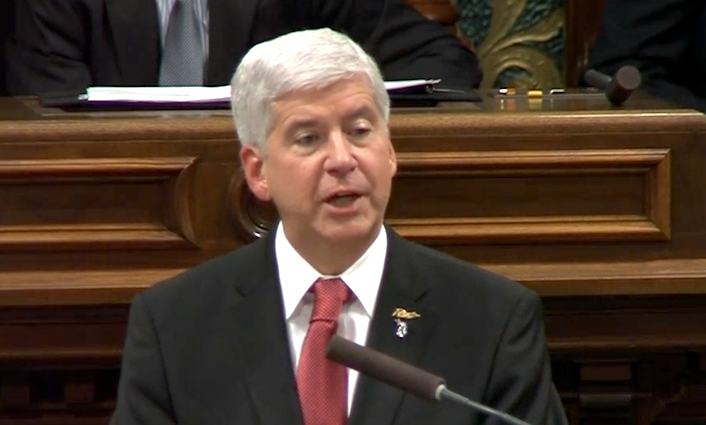 At least for now, Snyder, in his second term, has a little to no political credibility as a result of what is now a public health crisis and federally declared state of emergency, hindering both his future political prospects and current ability to advance his gubernatorial agenda. “His prospects for any sort of position are quickly dimming. His political future looks very precarious,” said Susan Demas, editor and publisher of Inside Michigan Politics newsletter. A year ago, a presidential run or vice presidential nomination was in the air as Snyder toured the country, officially, to tell ‘the Michigan story’ and perhaps find opportunities to aid the state’s economic progress. Most observers saw the tour, funded by a non-profit with undisclosed sources, as a means to boost his national profile and audition for a national office. “Now those things are off the table. They are out, as of now,” said Aaron Kall, debate program director at the University of Michigan in Ann Arbor and an expert on election political speech. The same is likely true of a federal cabinet appointment under a newly elected Republican president. “There’s always a chance for him to make some kind of political comeback, and this will start with his State of the State address," Kall said. Even if its perceived that he gave the political speech of a lifetime on Tuesday night, he will not rise from the ashes for quite some time; only then, if he follows the right political course, from visiting Flint to aligning himself with the mayor of the city to setting out a comprehensive plan to resolve the water crisis. Then again, “it depends how this scandal goes,” said Demas. At the moment, the Flint water crisis had become a touchstone narrative about racial and economic inequality in the Democratic presidential race with both leading candidates addressing the crisis last week. Even so, Snyder, a pragmatic CEO-style governor may himself be the primary obstacle to a turnaround. Although he issued an apology near Christmas, most of his remarks have been defensive and lacked contrition. He has lashed out at his critics and tended to shift responsibility for the failure to detect, disclose and address the problem. That the decision to change to a regional water system and temporarily draw on the Flint River was a cost-savings measure of a Snyder-appointed emergency manager does not help. On Tuesday night, he sounded contrite. In fact, it looked as if at times he was about to cry. And though he apologized profusely to the people of Flint, he still seemed to place much of the blame on others, particularly officials at the state Department of Environmental Quality, who failed to detect the seriousness of the lead problem. Even if Snyder manages an about-face in his personal disposition, sincerely apologizes and sets forth a good plan to fix the water crisis, the road to recovery may elude him because, to some extent, his future rests on facts not yet known. Is there a link between the lead-contaminated water system and Legionnaire’s disease cases? What will federal investigators discover about the level and extent of lead exposure and illness from the water system? How much will it cost to address the results and fix the problem?